Idag, d. 21.12 er det vinter solhverv, årets mørkeste dag. 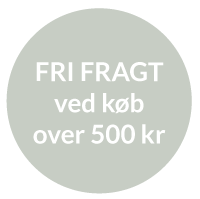 Fra i morgen vender lyset lige så stille tilbage. Jorden bærer i denne tid på dybe hemmeligheder – og solen, planeterne og stjernerne sender deres fineste energi hertil for at hjælpe forberedelsen som sker i mørket under overfladen. Det er også i det beskyttende mørke i vores sind at nye muligheder fødes. Vore livsdrømme kan nyde godt af den fine energi lige nu. Beskyt dem godt, som jorden beskytter sine frø. Find stille stunder til blot at sidde ved dem, være nær dem, som deres vidne. Bær dem ved dit hjerte. Indtil de en dag har fået næring nok til at møde lyset og begynde at spire der hvor alle kan se dem. 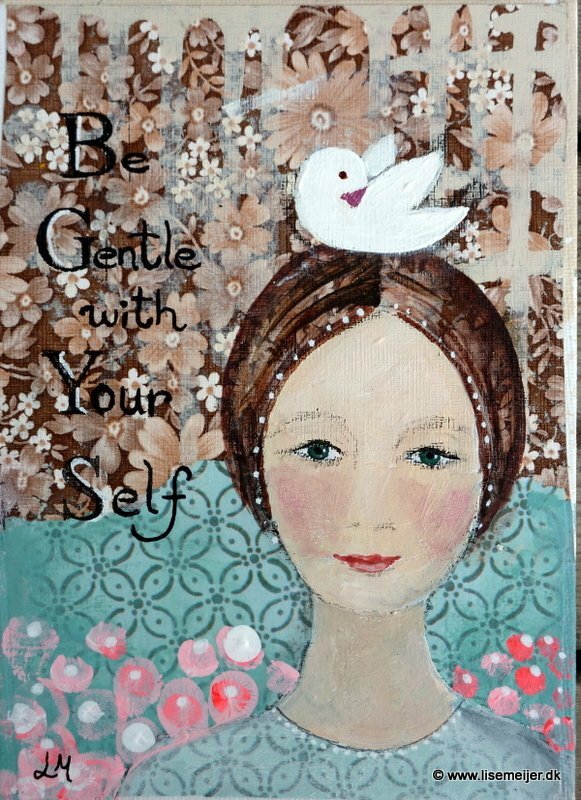 Be gentle – available as signed print, just click the picture….. 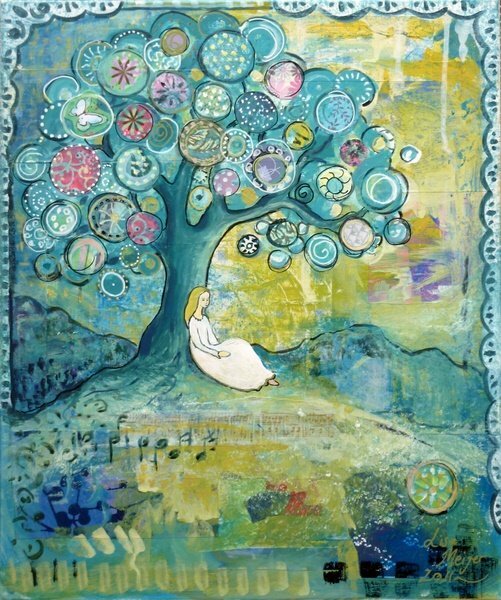 The gentleness you give yourself carefully nourishes your inner willingness to open yourself to life. When you treat yourself gently, your zest for life is allowed to come bubbling like a liberated source from within your own core. Carefully you are being listened to by the most important person in your life – yourself – and slowly you become open to the dance of life, of sheer pleasure simply because you can and want to. And in that dance lies a great strength. 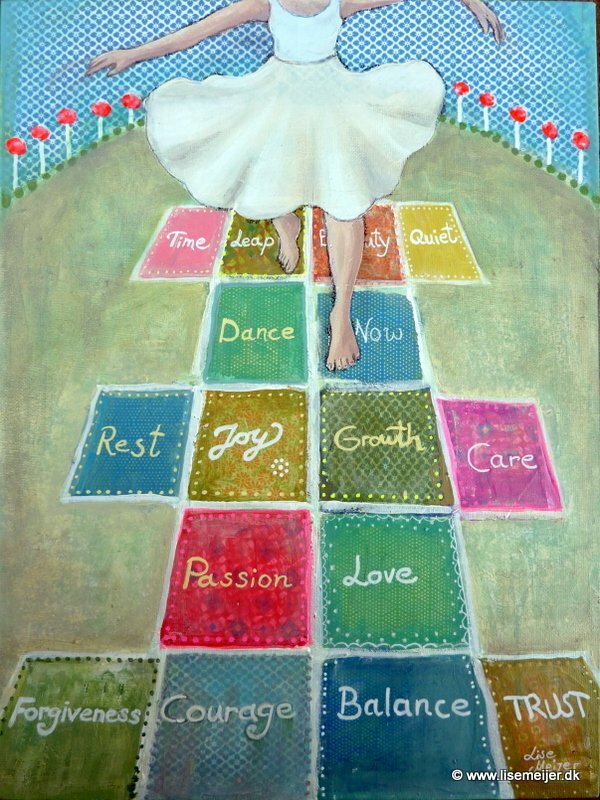 Willingness to the dance of life can not be stamped out of the ground or planned to the surface (though both stamping and plans have their place in life). The desire to be part of the dance of life must be nurtured from within, with gentleness, good things and much listening – from yourself to yourself. 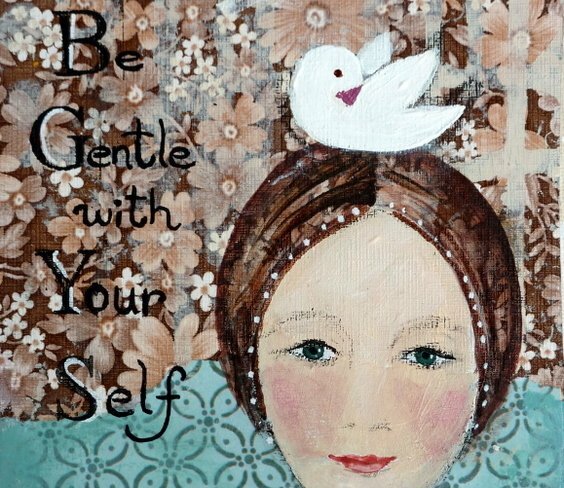 It is a powerful gift to be gentle with yourself. PS: The image “Be gentle with yourself” is available as A4 signed print HERE. 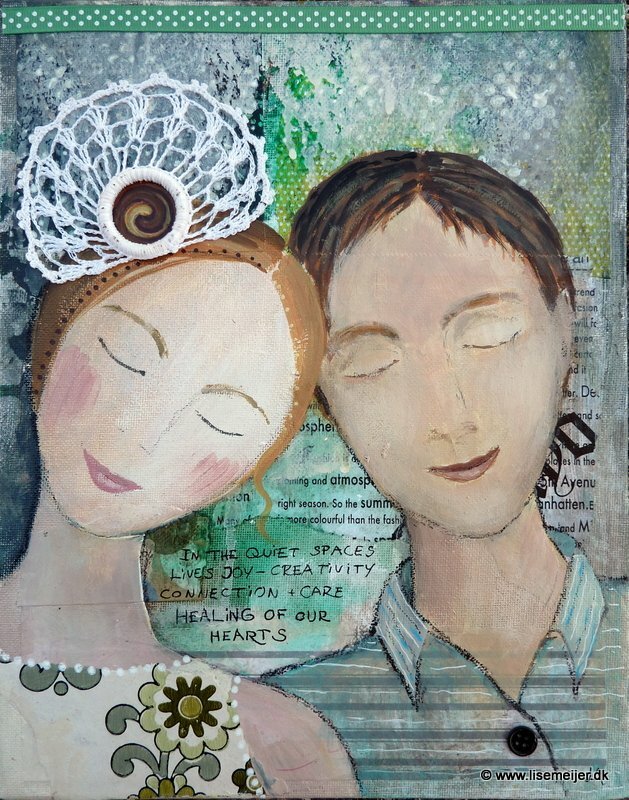 Perhaps you or someone you know would love a this sweet reminder for the wall? As always, I ship worldwide and package with care & creativity so it will indeed feel like a gift when you or your loved ones receive the items at the doorstep. 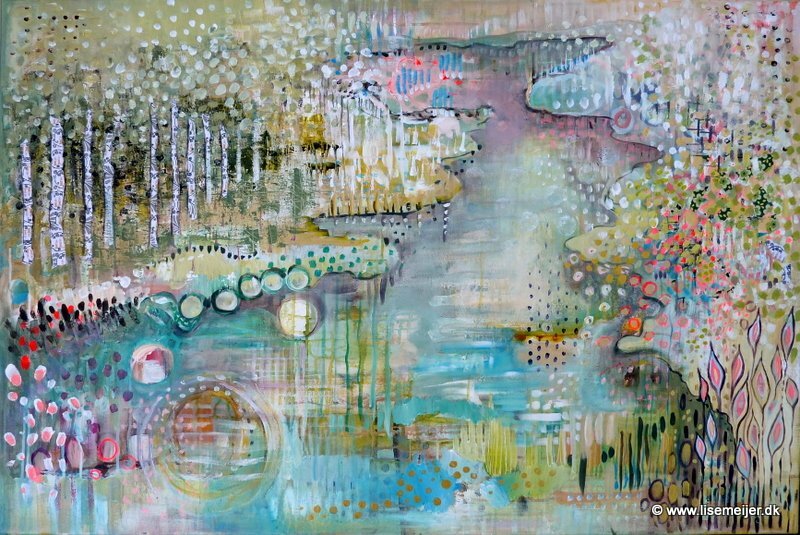 “River of my heart/ Hjertets flod” – 31,5 x 47,2 in/ 80 x 120 cm, acrylic and paper on deep edge canvas. Price: 925 $/ 6.500 kr. – Lately I have been pondering how emotions are like the weather: they shift according to all kind of outer influences – like high or low pressure, warmth or cold, and also pollution and many other outer or inner causes. It takes a lot of skill to learn to predict the weather, and even when the expets have done their best – they can be wrong! The weather color very much how we experience the day & the world, and it is NEVER permanent! Also, there is always, always a blue sky or a crisp clear starry night to be found behind the clouds. 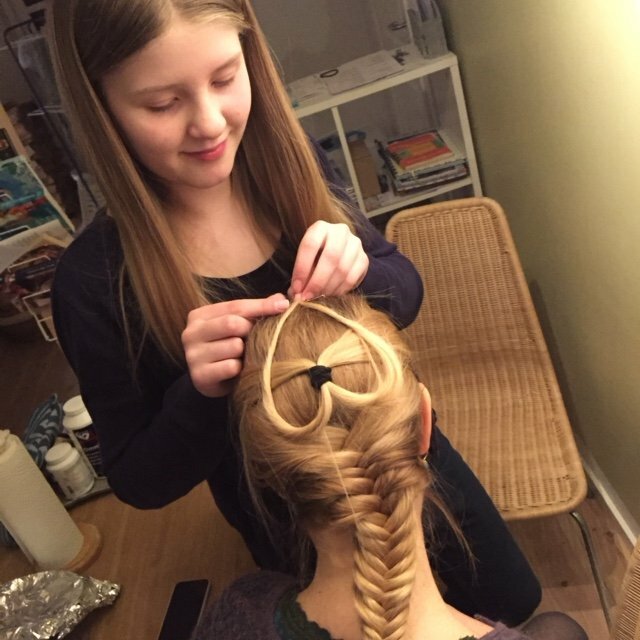 Above: Celeste (11) recently did my hair with an upside – down heart which I loved!!! It is the same story with emotions: they move through us all the time and like the weather they can never be completely fixed. They appear due to the processes we are exposed to, inside and outside ourselves, but it can be hard to always determine what caused them to turn up. And even harder to change them when cloudy emotions seem to fill the whole inner sky. The best cure of cloudy emotions I know is MOVEMENT! Any kind of movement; physical exercise, a walk, going to the cimema, doing some cleaning or tidying or creating something. It is also the last thing I want to do when stuck in heavy emotions. But once I do, things slowly shift. It often takes a while, but there will be a shift. And believe me, I had many (MANY) mornings in my life where I had no idea of how to get myself unstuck enough to begin working! Especially during the latest years where all I had to do was to get up, go upstairs and get myself to create. Wonderful when you FEEL like it! And seemingly impossible at other days. But I have sincerely come to love the fact that there IS something I can do about that state, even if I don´t feel the effect immediately. I love the fact that I can change my inner weather! And when nothing else works, I go to the chapter “Mood shifter” in this wonderful book. Highly recommended! PS: as always, I ship worldwide with joy, both items from my shop with prints and cards and original art! The other night I sat down in my living room together with Rune after the children were put to bed. During all the busyness of life we have learned that if we want to have some time together we best put it in the calendar, at least once a week. But often, when we reach that point of the day where the dinner has been served + cleaned away and the children has got their attention and love and are put to bed, we are both a bit frazzled. And it takes quite a shift to move into anything new. So, that night, we agreed to just sit for a while. And take a moment to breathe. And there I sat and was completely STILL. For more than 5 minutes. at 8.30 pm. Wow! As I settled, I began to notice the many fine sounds in the room. The calmness of the evening, inviting us to listen to the inner voice and find peace with whatever IS. And I SAW my life, and me in it. I began noticing how much I have in my life to be grateful for. It is a lot. And I felt the healing of being grateful for what there IS, rather than to long for what IS NOT. It hit me almost as a chock how I very rarely just SIT. Without having some specific inner or outer activity going on. I have many wonderful practices. 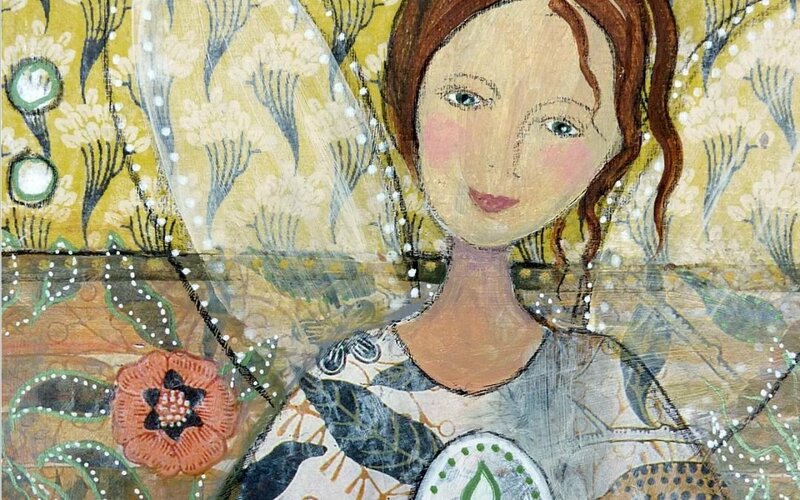 I consider my painting process as kind of a meditative state, a deep inner quiet and a connection to fine things. I do running and pilates. And I walk. I also write morning pages. But just sitting without doing anything has not been part of my practise, so far. From now on it will. And to be quiet together with someone I care for before engaging is a beautiful way to start a meeting. Thank you, Quiet moment. Once again, I am grateful to be alive. I will try to remember. I found this sentence today that I had dotted down on a piece of paper weeks ago. It was followed by these words: “Joy in every single step”. The funny thing is, I kind of think I wrote those words, that they came to me during my morning pages. But it was written a while ago I am not completely sure any more. Anyone recognize it? When I google it, all that comes up is advice on high heel walking!!! That wasn´t quite what I had in mind…. But that doesn´t matter, the words ring true to me and help me remember the importance of every single one of my steps today…..and every day. And that is what matters. A good reminder for me today. Most days actually. To me, walking with Grace means walking through life with the intention to stay aware and bring more light into this place. In whatever way that is possible. And I don´t mean that in any high-flying or quick fix way at all. I see it as a very real life challenge, where what counts most is the small adjustments in attitude. Every day, in every possible step. Some days it may mean accepting my boundaries. Or giving up on things I firmly believed I had to do. And other days it means daring to go out there in the world and do my best to let my light shine, even if it makes me nervous or doubtful at first. A beautiful challenge. I love this part of human life: That we are able to create something uplifting or healing by our small continuous acts of joy and awareness. Sometimes we need other people to remind us of the importance of all those little things we do to lift human life and bring more light here. So, here´s a little note from me to you: Thank you, whoever you are, for whatever act you are able to put into this world today that will bring more light and joy and make you bounce with grace in your steps. Perhaps you too need small daily reminders during this season leading up to winter solstice and Christmas. Reminders to your soul and heart that they are important players and allowed to be in charge. And that this season offers rich opportunity to connect to something deep & profound. Like LOVE. Like COMPASSION. And like FORGIVENESS. I have been pondering a lot about forgiveness lately and the enormous power that releases when we learn to forgive, instantly, rather than hold on to stress and hurt. Forgive ourselves and others. Simply and quietly letting it go…..now. “Quiet now” Original sold, signed prints available HERE. “Quiet now. 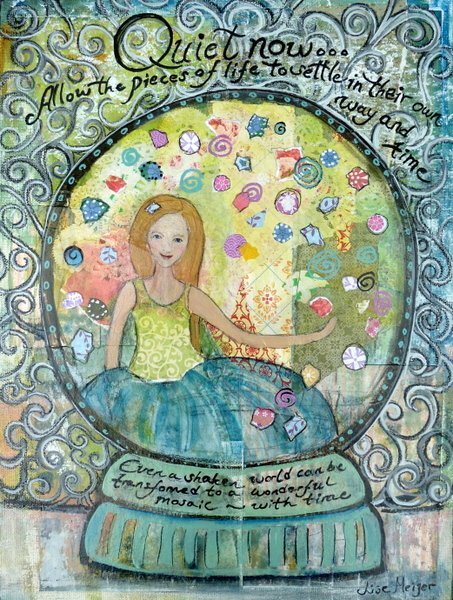 Allow the pieces of life to settle in their own way and time. “Today, why not ask for the creative and physical energy you’ll need, not just to survive The holiday season, but to enjoy it”. Oh yes, beautiful advise. Thank you Sarah. Wishing us all courage to pause long enough to feel our true priorities.